I can never make up my mind about how I want my site branding to appear. I like the Twenty Sixteen default, with the site title and tagline to the left and the menu to the right, but I also like everything centered. 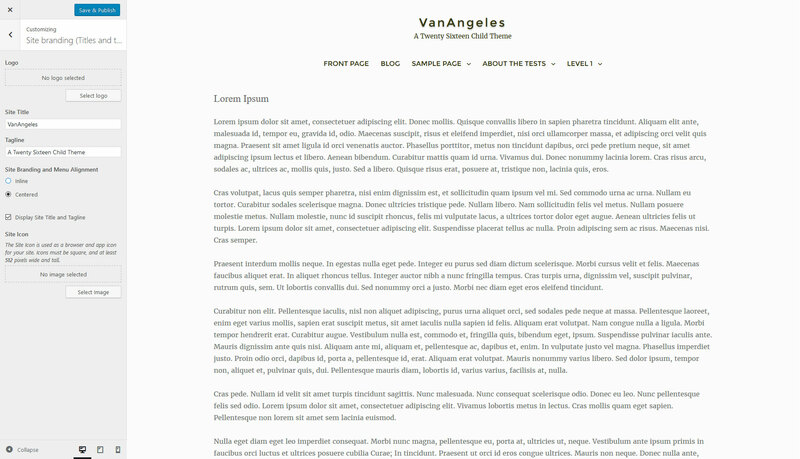 Astrid, one of the themes that I liked from the WordPress theme repository, has a customizer the allows for switching between inline and centered menu styles as well as a choice between a sticky and a static menu. I don’t care for sticky menus because I think they take up too much view-able area, but I like the ability to switch between inline and centered styles, so I incorporated that into my customizer. Astrid also gave me the idea of keeping all of my customizer code in a separate file, which ended up making my life a lot easier when I stumbled upon Kirki. Now I have one file that’s used when Kirki is active and the other is used when it’s not. All this does is set up the branding style control in the customizer; to get the control to actually make the change requires some additional code, which will be discussed later (see Hiding the Twenty Sixteen border). Note that I didn’t have to set up a panel or section because I’m placing the control in the title_tagline section, which already exists. If it didn’t, or if I wanted to place the control in its own custom panel I’d have to set up a panel, a section within the panel, a setting within the section, and finally the control within the setting before it would be visible in the customizer. In any case, even if the last option is chosen the site title and description are still visible to search engines – the effect of each of the four options on SEO is virtually identical thanks to Twenty Sixteen’s design.